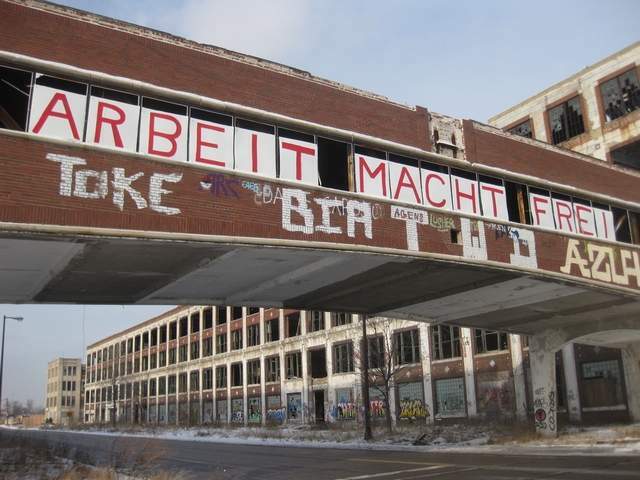 “Arbeit macht frei” (work makes you free) — three of the most profane and chilling words ever written — has been posted on the overpass of the mostly abandoned Packard Plant on the city’s east side. The phrase is a shocking and mocking reference to the infamous words posted over the entrance ways to a number of Nazi concentration camps during World War II, including Auschwitz, the horrific camp set up in Poland. It’s unknown just who erected the signs on the massive and graffiti-scarred Packard plant on East Grand Boulevard near Mount Elliot. The plant has become one of the city’s largest eyesores. It was built by the luxury automaker, which went out of business in 1958.
via Phrase made famous by Nazis appears on Packard Plant | The Detroit News | detroitnews.com.